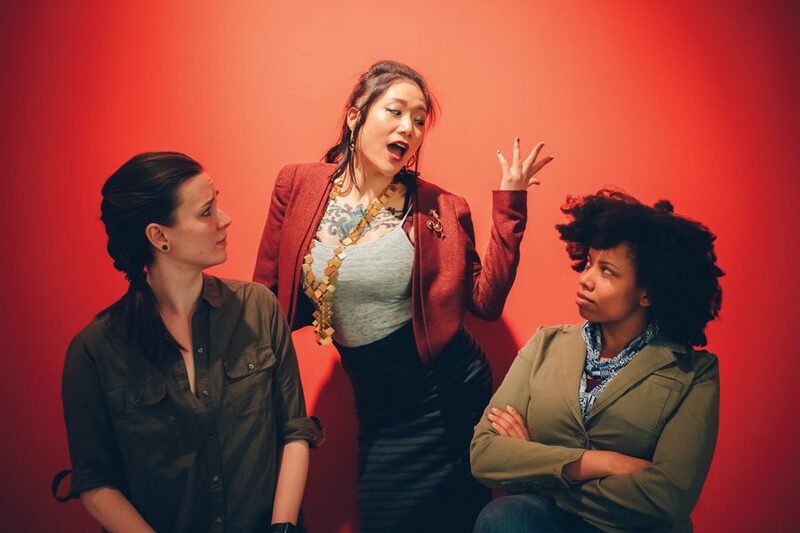 Kyle Lovett (left), Wanda Jin and Kenya Ann Hall play the roles of audience members and lecturer in a self-help seminar. “Cornerstone” explores the phenomenon of self-help culture. The show opens April 5 at Artspace 8 in Chicago and runs every Thursday through Sunday until April 29. The piece is an immersive theater production in which audience members attend a seemingly regular seminar hosted by an eponymous self-help organization. “The audience is supposed to be experiencing (the play) … just walking into something that appears to be a lecture, but might also be something much more sinister than that,” said Hall, who plays a skeptical audience member. Hall said some of the audience members, including herself, are actors pretending to be Cornerstone initiates or longtime customers. However, this distinction is not made clear from the beginning, leaving spectators on edge. Through this uncertainty, the play aims to make the audience question the believability of the information presented and ponder the prevalence of mob mentality, she said. Co-artistic director Hannah Ii-Epstein said the play is based on the experience of company ensemble member Jake Fruend, whose friend joined an organization very similar to Cornerstone. After attending a seminar hosted by that organization himself, Fruend witnessed first-hand the organization’s persuasive tactics, noting its resemblance to “a cult or pyramid scheme.” This sparked his initial conception of the play, Ii-Epstein said. The production involves a unique amount of audience participation, Ii-Epstein said. Attendees can roam their environment freely and interact with actors or just sit and watch the show unfold. Similarly, the cast is influenced by the audience as well. This strays from the traditional, more detached style of enjoying theater, Ii-Epstein said. Ii-Epstein and Hall said the name Cornerstone falls in line with the architectural language that is harnessed in the script. Both said the concept of a cornerstone — which is used to form the foundation of a building — reflects the central idea of helping the audience discover their principles and reach their maximum potentials. Playwright Kevin Sparrow said much of the script was created in collaboration with the actors, and together they worked from design books to apply the language of construction to self-help speak. When asked how the idea surfaced in the first place, he said the architecture motif has been integral to much of his writing and poetry.